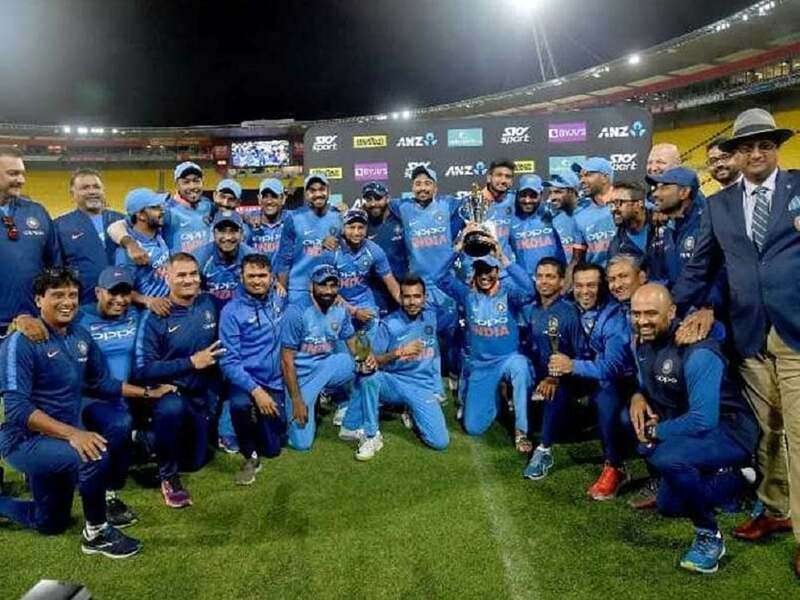 Home > Cricket > India in New Zealand 2019 – India wins the series 4-1!! India in New Zealand 2019 – India wins the series 4-1!! Indian juggernaut flattened another team down under, this time New Zealand, on its way to win the ODI series 4-1. The series was billed to be the ‘dress rehearsal’ for the World Cup in England. It has been a brilliant effort by the Indian team to win in an emphatic manner. The message from the team is loud and clear, India is ready for the World Cup in England! The final match of this One day international series was played in Wellington, the windy capital city of New Zealand. This city has a suburb called Khandallah and the Indian team must have felt at home. India beat the Kiwis by 35 runs to win the fifth ODI and take the series 4-1. What worked and What didn’t for the teams in the series? The last two matches showed the continued weakness of the Indian top order to high quality swing bowling in helpful conditions. This will be a worry for the team management, as they have a great chance of running into similar conditions in England. However, what will be heartening for them, is the way the middle and lower order rallied in the Wellington ODI to recover from 18 for 4 to finish at 252 in the fifty overs. Unfortunately for the team, this kind of fight back was not seen in the Hamilton ODI. The team management will remember that the World Cup will not provide too many opportunities to come back, like in a five match series. So, they had better watch out! Rayudu made a strong case for being the No.4, through a quality innings that he played in Wellington. He seems to be well suited for conditions like we saw in Wellington, where 250 to 270 will be a good score to set or to chase. However, he struggles to amp up the scoring rate or keep pace with high scoring rates on batting beauties. That can be a liability, like we saw in the second ODI of this series. The team management will have to choose his batting position or even his place in the team based on the pre-match conditions. Hardik Pandya continued his excellent comeback, after being sidelined by an off-field controversy. His swashbuckling innings in the Wellington ODI was the difference between an Indian win and a loss. The team and us fans will hope that he would stay in this mental zone during the World Cup and also the rest of his career. Hardik provides brilliant balance to this Indian team and makes India a potential World Cup winner. Mohd Shami is the biggest positive for the Indian ODI team to come out of the series down under. Shami picked up early wickets, kept the runs under check and along with the rest of the bowlers, has made India nearly unbeatable. Chahal is the other positive for the team. He has been brilliant by picking up crucial wickets in the middle overs. The big difference between this Indian team under Virat and the earlier successful Indian teams under Dhoni or Sourav, is this ability of the bowlers to pick wickets all through the innings, both home and away. Indian bowlers are routinely picking up 9 or 10 wickets in many of the matches. Wickets win matches! On the negative side, Bhuvi’s form has remained below par, right through this series. Kuldeep has also been up and down in form. These two will need to raise their game in the World Cup. There is still plenty of time for them to get back to consistent form and execute it in England. Hardik impressed with his bowling as well. He bowled at good speeds (~140 kmph) and picked up important wickets as well. The Kiwis have a lot to worry in this department, particularly at the top of the order. Martin Guptil was unrecognizable in this series. He is a key part of the Kiwi top order and he needs to pick himself up in the next few months. Munro does not look like a good bet at all. The team management will have to look at alternates like Henry Nicholls or other opening options in their domestic circuit. Tom Latham has looked the best Kiwi batsman in this series. He played very well in the earlier ODI series against India in India as well. Kane Williamson was not at his best in this series. He, however, did manage to score some runs to contribute to the team’s total. Like a true champion, he was prepared to bat ugly, while not at his best. New Zealand have always been blessed with good all-rounders. Jimmy Neesham is another one of those all-rounders. He showed his hitting abilities in the last match. As we have seen with New Zealand over the years, they always manage to load a few all-rounders in their team, who bat in the lower middle order. So, they may not worry much about this part of their batting order. The Kiwi bowling was quite solid in this series, despite their ending up on the losing side. Trent Boult was the stand out bowler in this series. The great thing about Boult is that he has the ability to run through batting units. In helpful conditions, he does not settle for 2 or 3 wickets, he picks fifers and sixfers! These spells tend to shut the opposition out of the match. With such a wicket taker in the team, the Kiwis will pose a big danger in England. Matt Henry looked good in the series with good pace and strong ability to pick top order wickets. The Kiwis have a few more quick men like Lockie Fergusson and Adam Milne, who can be quite dangerous with pace and movement. Tim Southee, is another option for the Kiwis in helpful conditions. So, I think the Kiwis won’t worry much about their fast bowling options for this World Cup. Their bigger worry will be in the slow bowling department. Mitch Santner has returned from his injury layover and hasn’t been at his best. He is an important part of the Kiwi bowling plan and they will pray for his return to form. Ish Sodhi, was also out of form in this ODI series. But against teams that don’t play wrist spinners well, he will be a handful. India have outplayed the Kiwis in this series. However, the debacle at Hamilton will keep the team honest and grounded. The team for the World Cup is more or less in place. Virat and Shastri will be very happy about it. From now until the World Cup, the impact that the IPL will have on the team’s physical fitness will be their chief cause for concern. Otherwise, the team looks all set. I hope to see them in the last four. On the other side, the Kiwis have to sort out their top order in batting. Barring this, they have the rest of their bases covered, with back-up options as well. They have historically punched well above their weight in World tournaments. So, I won’t be surprised if they ended up in the last four. For this to happen, however, good top order batting form is a pre-requisite.